I’m becoming quite a regular visitor at Hotel Du Vin, especially when being invited to sample their new menu launches. The last time I visited Hotel Du Vin, Birmingham was in April of this year when they launched their a la carte HDV bistro menu offerings. A few weeks ago I was invited back to dive into their summer menu and to meet the new hotel manager – Tom Gallimore. He sat to the side of me and Adam Hayes, so I had a good chat with him throughout the night about his new job as manager, and his family life. Tom is a fantastic guy, and loves to get stuck in and drink wine, just like us bloggers. He definitely deserved a seat at the table! Menus change seasonally, so you can expect to see the latest menus on the HDV website menu section. After a glass of wine in the Bubble Lounge and mingling with the other bloggers, we were shown through to the restaurant where we took our seats for another intimate dinner. Tom did the honour of ordering starters to the table from the summer menu; one being the gigantic Fruits De Mer platter. The plate arrived right in front of me, so naturally I got some great shots. It’s enough to feed 4 people, and the finger-food tray consists of Oysters, lobster, Salcombe crab, prawns and squid ceviche. Also served with shallot vinegar, cocktail sauce, home-made mayonnaise and bloody mary ketchup, this was the showstopper of the entire night. Coming in at £69, this sharing starter is an absolute steal between a small group. A small selection of other gorgeous starters began to arrive at the table at the same time, including the Caprese Salad (£7.95) with Isle of Wight tomatoes, 12 Escargots À La Bourguignonne (£11.95), and some Toulouse Sausage (£6.75). I’m certain the Soupe Au Pistou (£7.50) was tasty but didn’t get around to trying it. If you’re interested, it’s a fresh light minestrone soup, garnished with home-made pistou. I’m a huge fan of snails in garlic and herb butter so this starter was incredible; even more so after dipping salted buttered bread into the herby breadcrumbs. The snails were incredibly tender and I was so eager I started ripping out the meat with my finger instead of using the fork provided. Absolute savage. I only managed to try a few of the sausages which were juicy, and the salad was flavoursome and refreshing. The summer menu still boasts all of the french classics including cod, liver, steak tartate (which I tried last time and was incredible) but this time I opted for the Steak Hache, Sauce Au Poivre for £14.50. Served with pomme frites and a dipping gravy, my god was this delicious! Paired well with a beautiful red wine, I ‘mmm’d’ and ‘ahhh’d’ for a fair few minutes whilst slicing the steak into small chunks and throwing them into my mouth. I saw others order Sea Bass en Papillote (£14.50) which looked incredible, and others attempted the Poulet Basquaise (£13.50) served with tomatoes, peppers and olives, pilaf rice. Everyone’s meals looked great and I’m certain we all loved our choices. You can’t have a bad meal at HDV in my opinion. When finishing a hearty main course, we were promised dessert. Ranging from Strawberry Sundaes (£6.50) through to Pineapple and Mango Carpaccio (£5.95) – the Mousse Au Chocolat (£6.50) is a classic chocolate mousse with crème Chantilly and was the perfect finale to a great meal. 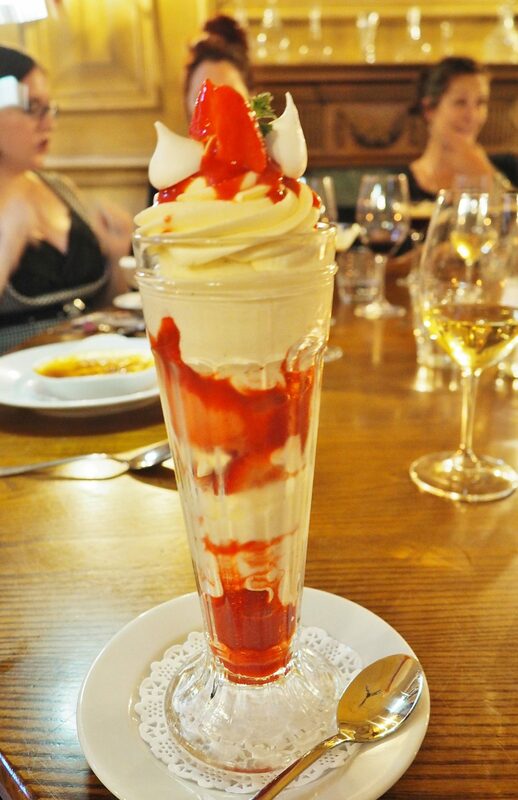 The cream was thick and the mousse was tantalisingly sweet – ideal for a sweet-toothed foodie like my. On the side, the cheese trolley (£11.75) provided a great selection of French and British cheeses, served with biscuits and chutneys. Huge thanks to Delicious PR for another invite back to Hotel Du Vin to experience this fantastic summer menu. This new menu offers a variety of starters, main courses and desserts which will guarantee to fill your stomach. Combining an incredible array of both French and British classics, a huge thank you to HDV’s new Hotel Manager and the staff for another wonderful night. It won’t be forgotten in a hurry. Please note: I was invited to sample the new menu as a guest of Hotel du Vin, Birmingham. My meal and drinks was complementary in return for an honest review.